Late summer turns are always rewarding! 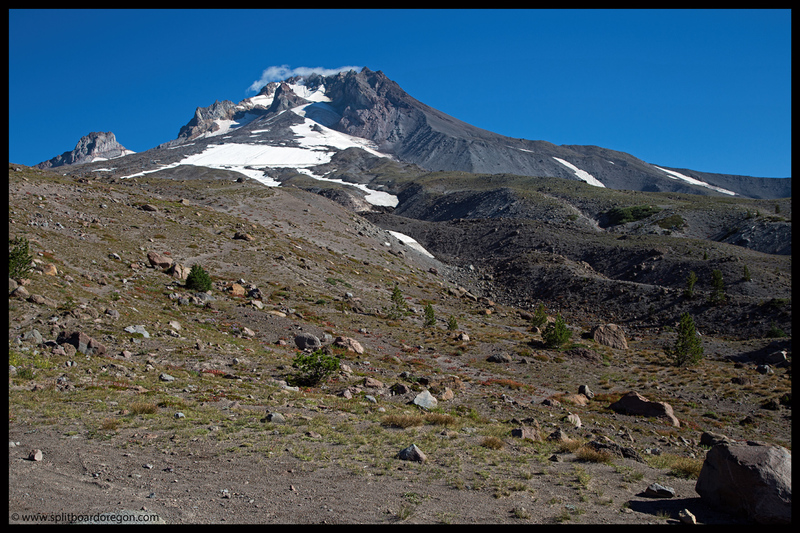 Though the snowpack is down to only permanent snowfields and glaciers , the cooler mornings of late summer mean fall is on it’s way, and with the changing of the season comes the promise of fresh snows and a new winter. 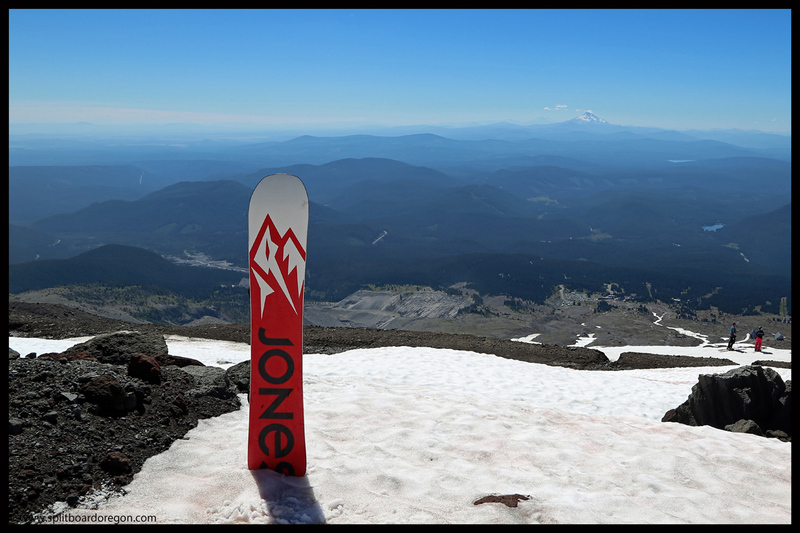 So, hoping for a fun day of late summer turns, I headed north on I-5 with Joe en route to Mt Hood. 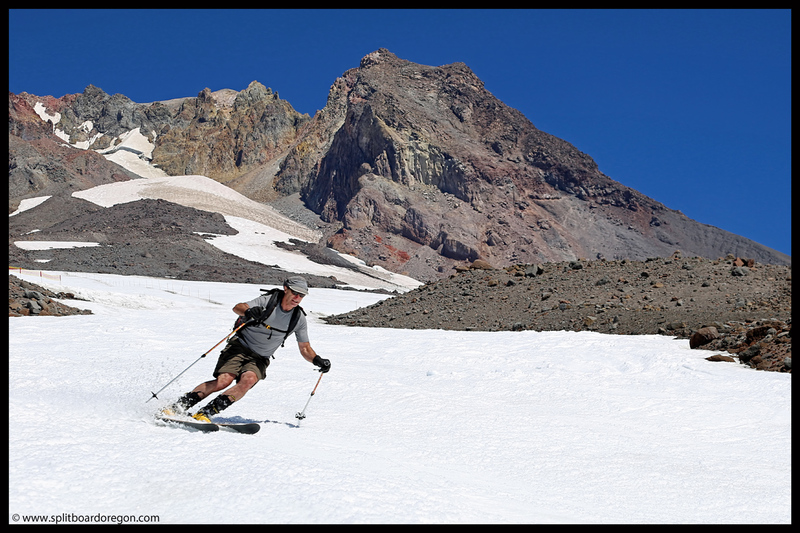 After a brief stop to pick up Ron, we arrived in the Timberline parking lot around 9:00 am and found Todd, who’d skied the night before and camped near the Zigzag Canyon to avoid the holiday crowds. 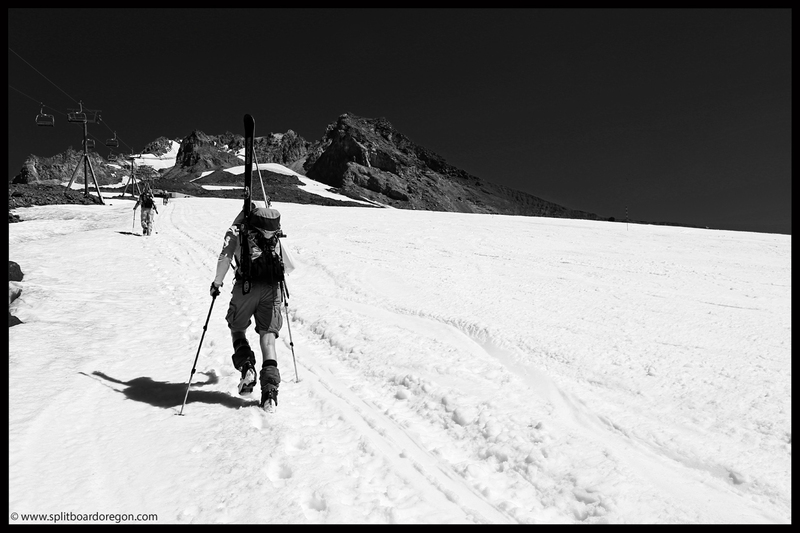 After our gear was packed, we hit the trail with the intention of making turns on the Palmer snowfield and possibly beyond if conditions looked good. 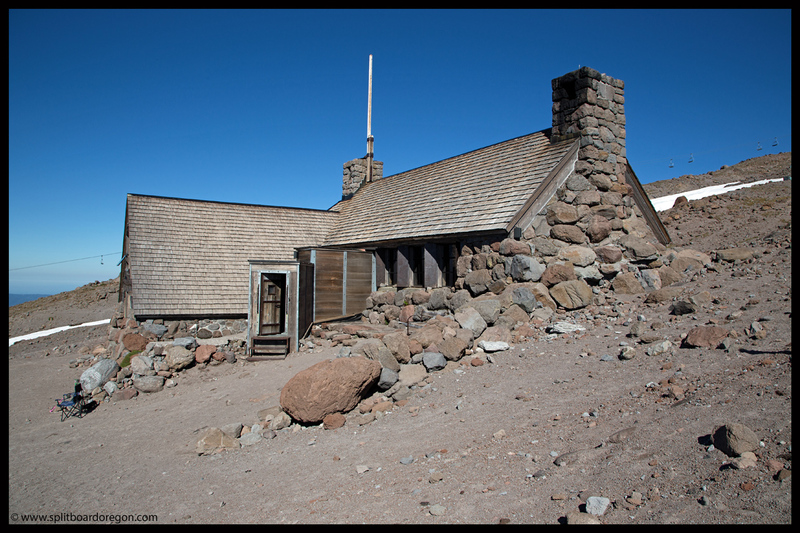 After the previous week’s rain, the air was clear for the first time in awhile…..
Before long we reached Silcox Hut, and stopped for a quick water break. Even though it was late summer, the day was warmer than the last several and the cold water tasted good. A minute or two later, our group was joined by Dan who’d stayed at the lodge the night before, skiing with Cindy on his birthday. We arrived at the top of the Palmer a few minutes after 11:00 am, and soaked in the views of Mt Jefferson and the Three Sisters to the south. As usual, the views from the top of the Palmer didn’t disappoint. The north side of Jeff looked about usual for September, with a few spots that would make for good late summer turns…. Rather than head higher up on the White River snowfield, we made the decision to ride the Palmer and come back for a second lap to enjoy the smooth corn. All of us had to stop halfway down to rest our legs, a symptom of not skiing on a regular basis through the summer. At the bottom, Todd needed to head home, so we bid him farewell before heading back up. The boot up the second time went much quicker for me, and I stopped to snap a few pictures here and there. 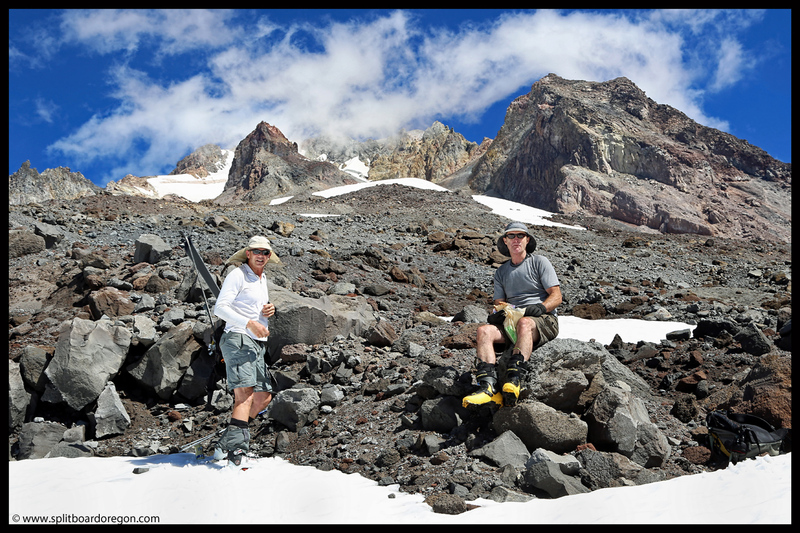 When I arrived at the top, I saw some cool clouds over the mountain’s summit, and snapped a photo of Dan and Ron sitting on the rocks. That photos is shown below, as well as a picture of Dan and Joe on the boot track…. Run number two was equally as fun as number one, and I kept my camera in the bag until we were into the Mile Canyon. 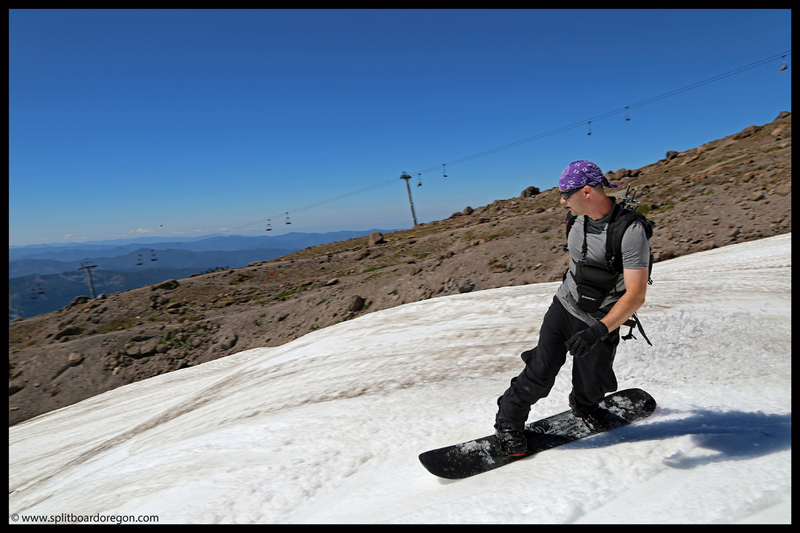 After catch a few photos, I handed it off to Joe who snapped a couple pictures of me enjoying some September turns…. Even though the spring and summer were remarkably dry, we were able to ski to within a few hundred yards of the parking lot, making for a quick hike out. 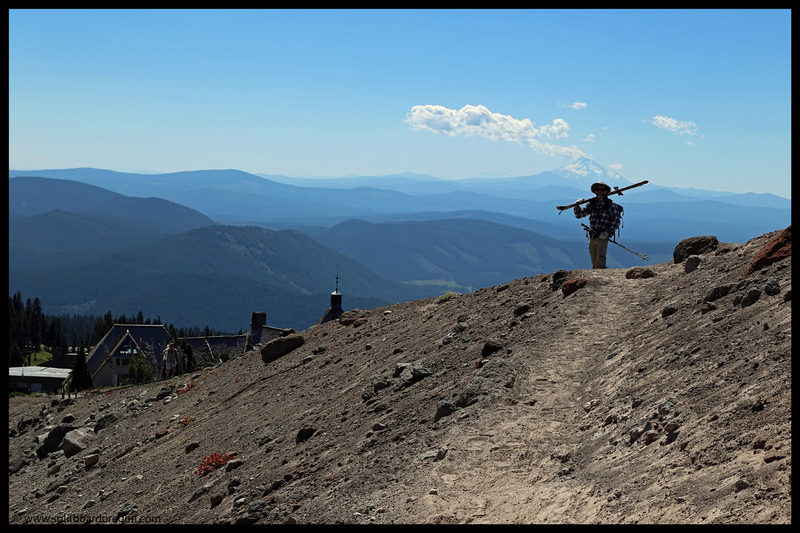 On the trail, I snapped the below picture of Joe silhouetted against the sky with Mt Jefferson and Timberline Lodge in the background…..
Back at the car and in a comfortable pair of flip flops and shorts, we enjoyed one of Ron’s IPA’s, along with some fresh chips and salsa from my garden. 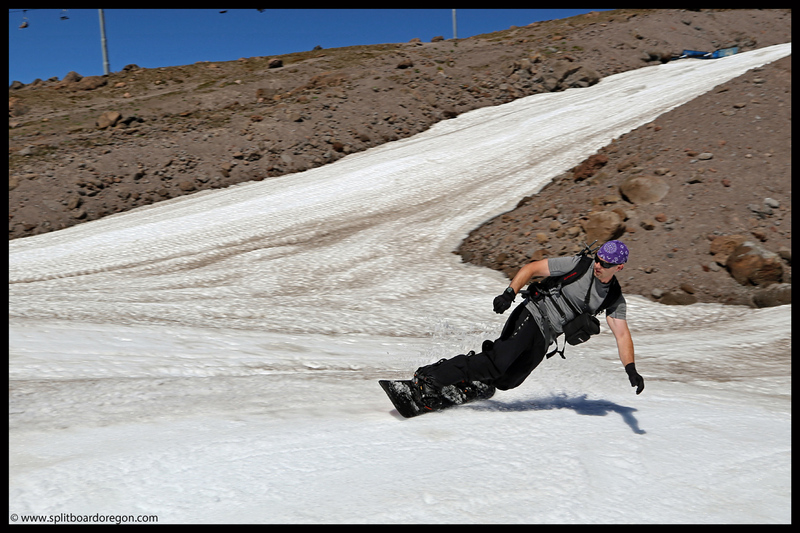 Yes, late summer turns are great, and I’m looking forward to a good fall and powder filled winter!